In my work as a professional organizer, there are many occasions in which my former career as a psychologist comes in quite handy. 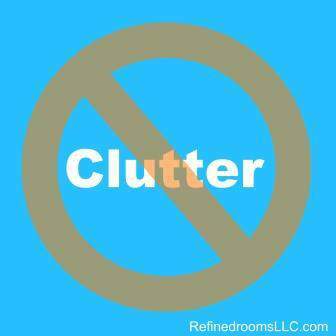 For example, a new client that I worked with for the first time this week expressed extreme frustration regarding the clutter that her spouse creates in their home. She’s not alone. 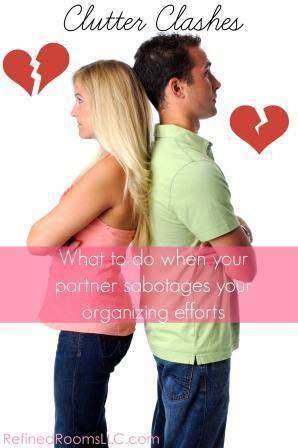 Since organizing is a teachable skill, it may be worth the investment to hire a professional organizer to assist your partner in learning new organizing skills (if s/he is open to it). The organizer can triage the most problematic areas in your home, declutter, create systems, and provide instruction on how to maintain an organized state for those particular areas. You can find an organizer who works in your geographical area by searching the National Association of Professional Organizers’ online directory. As in any area of disagreement, the art of compromise should never be underestimated. Perhaps you can come to an agreement that the common or “public” areas need to be kept uncluttered and organized, and you’ll learn to accept disorganized bedrooms, basement, and closets. Another way to compromise might be to reach an agreement that you will take on the role of resident “cleaner/organizer”, if your partner prepares all the meals and handles all the laundry. This way, you can each play on your strengths and preferences to work as a team in order to maintain the household in a way that is acceptable to everyone. If all else fails, designate a particular room or portion of one that can serve as your haven from the rest of the cluttered house. Ask other family members to refrain from using the space (unless they are able to maintain its clutter-free status). My organizer colleague Sherry Castaldi of Organized by Design recently discussed her survival tips for couples who find themselves on opposite sides of the “Organized vs. Disorganized Continuum”. She emphasizes the need to manage your expectations…although you may improve some of the ingrained habits of your disorganized partner, you are unlikely to transform them into Peter Walsh! Do you and your partner experience “Clutter Clashes”? If so, how you have successfully navigated through this conflict in your household? « WHAT’S YOUR “ONE THING” FOR 2015? Excellent article Natalie! We were on the same wavelength! Thanks so much for the mention! Love the “Clutter Free Zone” concept! I also like the “clutter free zone”. Lucky you Janet! I wholeheartedly agree with the idea of everyone deserving to feel comfortable in their own home. You nailed it! I’m fortunate to have married someone who is as neat as I am, if not moreso, but I do like the idea of a “clutter free zone.” Everyone should have a spot where they can be comfortable in their own home – whether it’s clutter-free or totally chaotic!